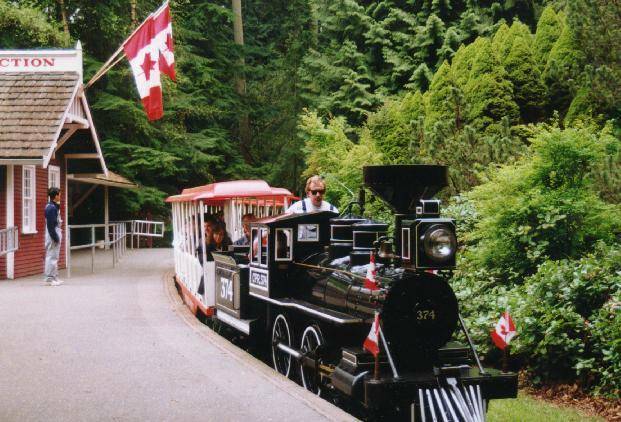 On Saturday afternoon, we visited the seasonal attraction of the Stanley Park miniature train ride. Our good friends here invited us to join them as they have two boys too. We set off on bicycle which I might add might have been a little ambitious as it was a 45 minutes each way. There was the right amount of breeze to stay cool on this mission and a little sun out so cycling conditions were good. When we arrived all I could think of was throwing back a cold lager. Alas, that would have to wait till later and I went with the sensible choice of hydrating with water and topping my energy stores up with popcorn. 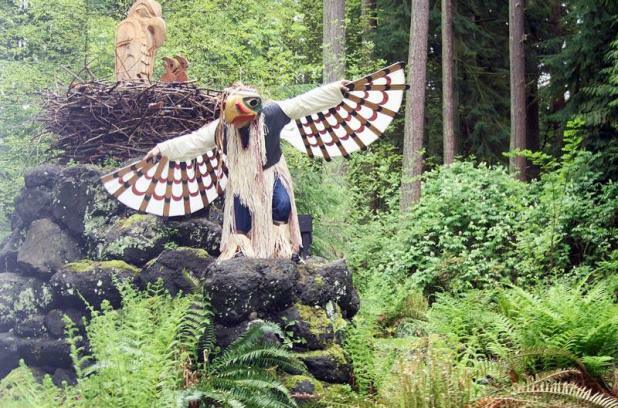 The entrance to the Klahowya Aboriginal Village was marked with a colourful designed eagle board leading us into where the ‘spirit train’ is situated. This is a great way to learn about the legend of the ‘Sasquatch’ or Bigfoot. For a family with children under four years of age, a group ticket is the best value at $25. The train ride is approximately 10 minutes long. The train is a replica of the Canadian Pacific Railway engine #374. This engine was made famous by pulling Canada’s first transcontinental passenger train into Vancouver in the late 1880s. There was the story, song and dance as we weaved around the forest track and tunnel seeing animals like the eagle, bear, frog and Sasquatch. I also learnt that they have a special Halloween themed train ride and Christmas lights themed ride as well which sounds wonderful. A relaxed way to spend the afternoon…until the way back. One huge black cloud loomed and just as we jumped on our bikes it started to rain, a little, a lot … then we were drenched! Of course, this was the day we left over enthusiastic and under prepared without any rain gear. We hightailed it half the way until we made it to the safe haven at Steamrollers – 437 Davie Street at Homer, Yaletown. They are seriously quick and healthy burritos, not to mention so delicious! They are a Quick Service Restaurant (QSR = fast food), which only uses steam to cook their food, preventing shrinkage, locking in moisture and nutrients supposedly. They even provide kid’s options on the menu which got the thumbs up from our little guy. Ok, so a little damp later we made the dash again to the Canada line down Davie Street and jumped on with our bikes to get us as close to home as possible. Dare I say, this an accomplishment even a local Vancouverite would be proud of! The evening ended with a warm bath and finally a good lager! I highly recommend the Calico Brown Ale by Tenaya Creek, Nevada. It goes without saying that after all that the household was very peaceful as we all slept really well. Please note: The photos represented here are not my own (sourced from google images). 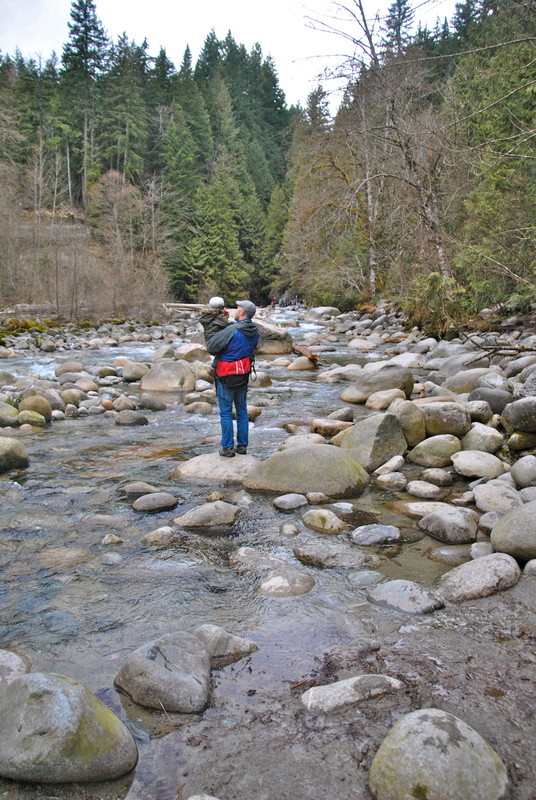 This Easter was the first active one I’ve had in many years, so I have had a guilt free (well 90% guilt-free) holiday which all began on Good Friday with a hike around Lynn Canyon Park, http://www.lynncanyon.ca. It is has a suspension bridge which is 50 metres above the canyon and the power behind the waterfall is immense. Although it was a leisurely hike, it was part of the Baden Powell Trail, which is one of the most well known trails in North Vancouver. 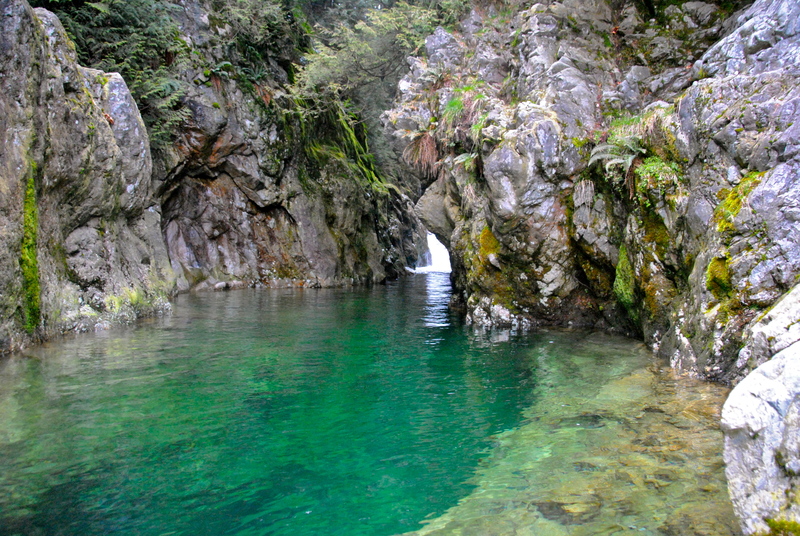 We made it to the 30 foot pool which was stunningly beautiful surrounds and the water was a translucent emerald colour and I was tempted to have a swim although the temperature was about 8 degrees! It’s worth going for a few hours with young children or for the really adventurous a whole day would be worth it to bring a picnic and walk all along the trail. First chocolate easter bunny polished off on trail. On Saturday, riding around Stanley Park is a must do with or without children in Vancouver anytime…however you will be told by Vancouverites as long as its not in the middle of Summer! The traffic of bikes, rollerblades, skateboards, anything with wheels really builds towards the warmer months, so you need to be prepared to slow down or dismount occasionally, however the scenery around the park and harbour including beaches is guaranteed to get you back on your wheels for more. If this is a little too touristy for some, then some of Vancouver’s greenways might be the way to go. Greenways in Vancouver are linear public corridors for pedestrians and cyclists that connect parks, nature reserves, cultural features, historic sites, neighbourhoods and retail centres. Another easter egg polished off on bike ride. Vancouver wants to be the greenest city in 2020 and therefore has many goals to achieve which you can read more on the talkgreenvancouver.ca. One of them is to make cycling, walking and transit around the city more desirable and convenient, and given my experience here is not depending on a motor vehicle the City of Vancouver are so far making it really easy for me. They have taken it really seriously that their first target in 2020 is to have over 50% of trips take place by walking, cycling and public transit. Their second is to reduce motor vehicle kilometres traveled per resident by 20% from 2007 levels. We have joined metro Vancouver’s only car sharing co-op; modo. It’s a no brainer really; lower cost for the times when we really need a car, and lower cars on the road equals lower greenhouse gas emissions and less traffic in the city! They are well maintained cars and you have a wide selection to choose from, depending on where you want to pick one up from across the city’s modo network. 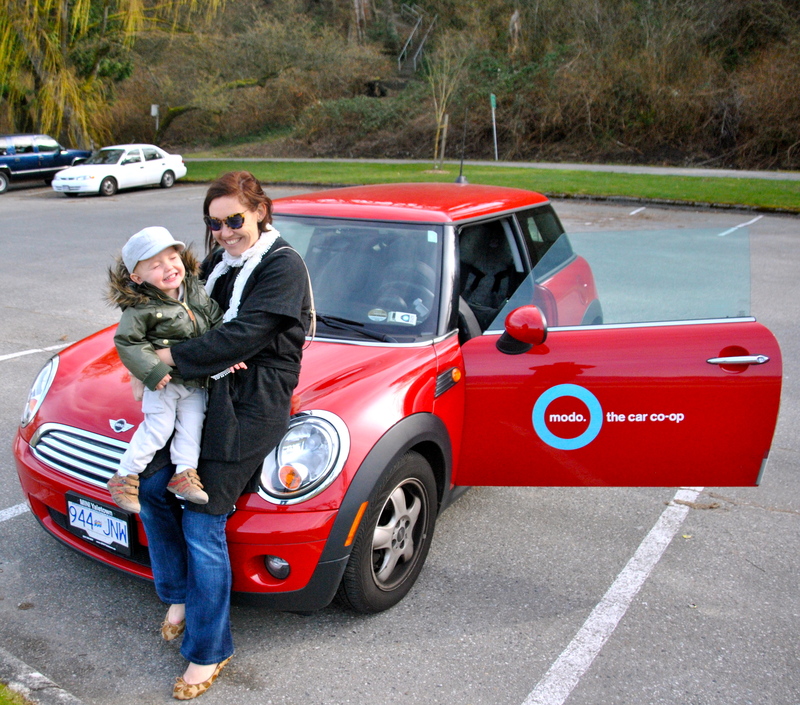 We picked up a red mini recently to zip around the beaches in Kitsilano, west side. 3. Third green action – ENSURE 50% OF MY TRIPS AROUND THE CITY ARE SANS CAR. Next stop for Easter weekend is a day trip out to Harrison Hot Springs in a modo!